The giveaway this month at The Natural Sleep Store the focus is on something quiet, something a little more understated, but not any less wonderful than organic wool or natural latex—Kapok! The Natural Sleep Store specializes in products that help create a healthy, cozy, comfortable sleeping space. We are passionate about providing mattresses and bedding that are chemical free and easy on the environment. Our giveaways are meant to bring attention to new products, products or companies we love, and items that we think are wonderful but may get overlooked. 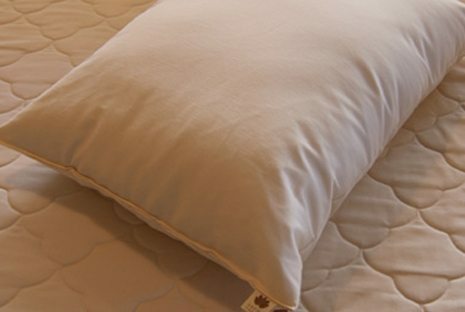 This month The Natural Sleep Store is excited to offer the Sachi Organics Kapok Pillow (a value of $90). Enter to win. No purchase necessary. Kapok is a silky fiber harvested from the seed pods of the kapok tree. It’s very fine and feels a lot like milkweed or down. The Sachi Organics Kapok Pillow is one of the softest pillows The Natural Sleep Store offers. Our latex and wool-filled pillows can sometimes steal the show because the materials are so well known, but the plush, cushiony feel of kapok is sure to be a hit with anyone who gives it a try! Another thing we love about kapok—since the fiber is harvested from the seed pods, the tree doesn’t have to be cut down. Kapok is healthy and sustainable which is good for both you and the environment! And of course the pillow cover is made out of a beautiful organic cotton sateen. Enter to win a Sachi Kapok Pillow. No purchase necessary. Giveaway ends June 30th.